We were lost! 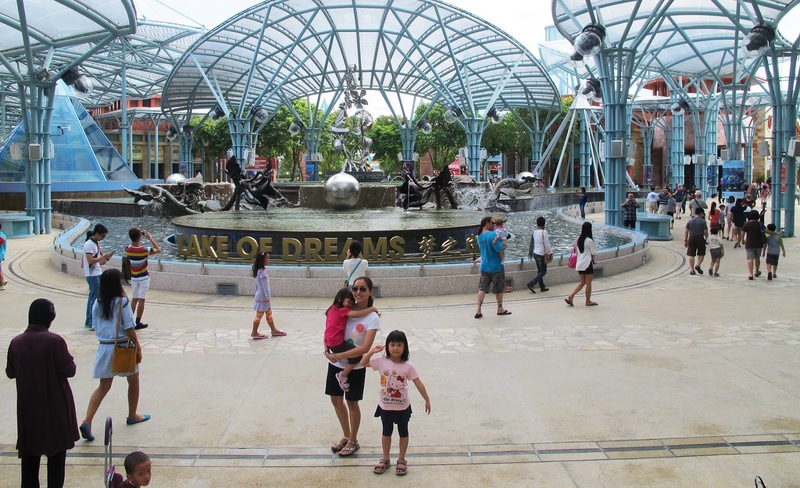 This was our very first time at Resorts World Sentosa, and everywhere seemed to point to our target destination. 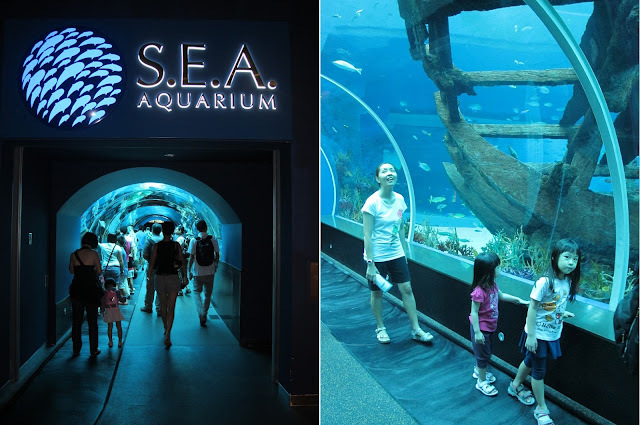 The last time we came as a family was likely to visit the original Underwater World Sentosa at Siloso Beach. We heard a lot about how massive the RWS Marine Life Park is, and we were all ready to be wowed by the spectacle. The VIPs (dolphins) weren't on display yet, but we were sure that the 800 plus species of marine life would be enough to capture our imagination. Finally, after a little unplanned sight-seeing and snapping of pictures with our friendly Merlion in the background, we found the aquarium. We had purchased our tickets online, which turned out to be wise as it was a public holiday and the ticketing queue was long. We breezed past the lines, had our print-outs scanned and in we went. A quick sandwich from the Fish & Crab Shack and the walk into the aquarium brought us through a gallery of the Maritime Experiential Museum. We were not here for the maritime exhibits, so we tried to hurry past them. 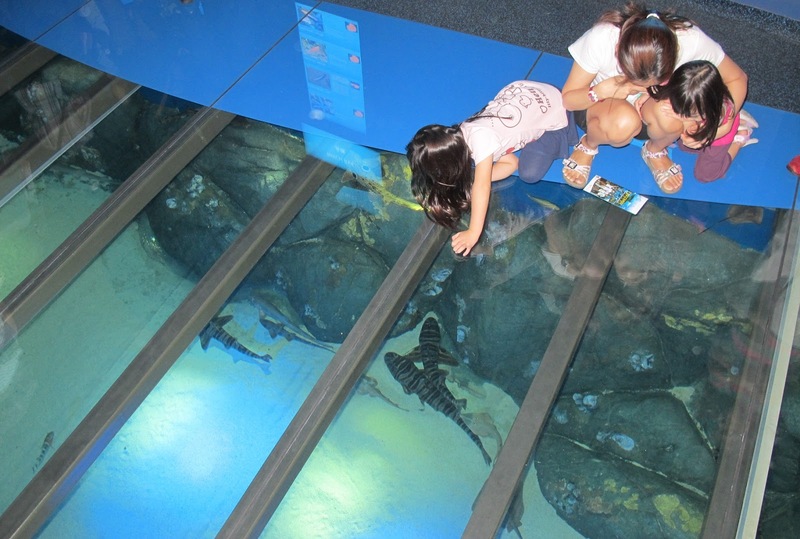 Despite our haste, there were many interesting items that caught the attention of our kids. The theme of the gallery was entitled 'Pirates of the East', which showcased the adventures and exploits of famous Asian pirates and pirate hunters in a historical era. 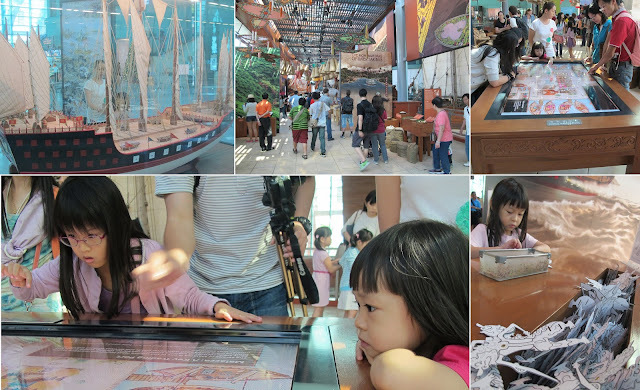 The children were enthralled by large ship models, interactive digital platforms, and colour Wayang Kulit cut-outs, with informative posters on the trade of the maritime Silk-Route. But we've got 'bigger fish to fry' and this is not what we came here for. So we move on, down past additional ticketing counters and carpeted passageways until we catch sight of the entrance to the tunnel aquarium. Over the two and a half hours, we will be covered in shades of blue and green. The first exhibit through the tunnel was a mock-up of a wreck colonized by the creatures of the sea. It was a nice but short appetizer for the long walk ahead. 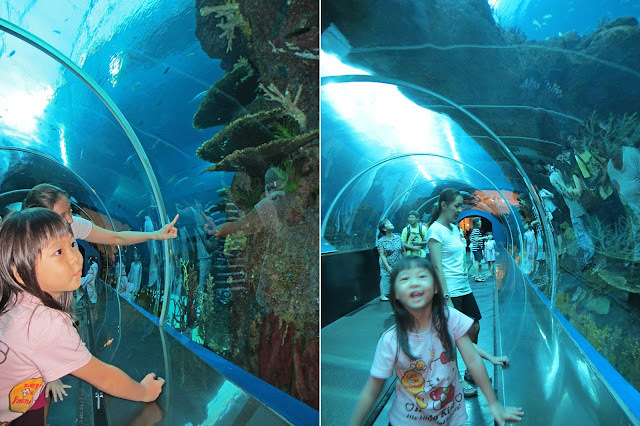 The tunnel reminded us of Underwater World Sentosa (UWS). 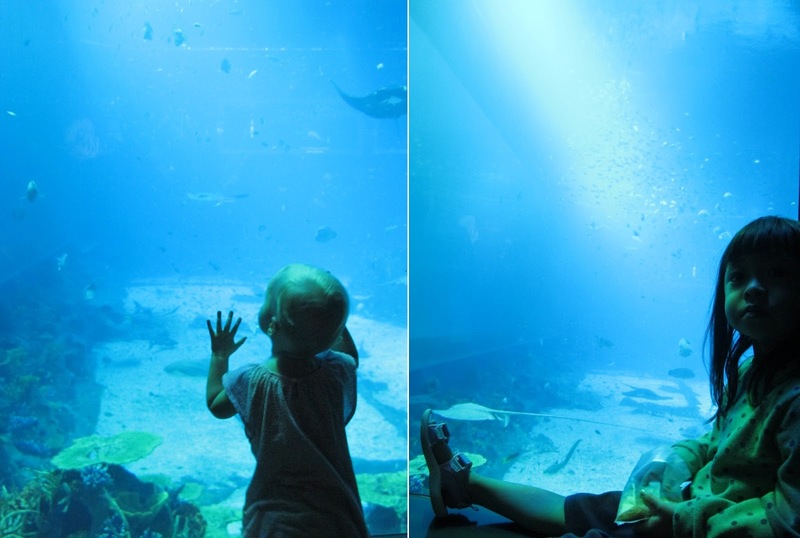 Needless to say, the exhibit sent blood sugar levels of our girls soaring and they started peering and marveling at the fishes swimming in and out of the 'wreck'. ... and then there was an interesting floor tank, which we sent the girls down on their fours scouring the reef for small sharks and rays. I liked the concept as the bird's eye view focused on animals on the reef floor, and left little room for the critters to hide, making most of the critters very easy to see. There were many other kids crawling around on their fours too, oblivious to the crowd trying to navigate their way around these tiny obstacles. A short walk through a static exhibit and giant posters brought us to a cylindrical tank with a large 'coral encrusted' pillar in the centre. The tank was about two stories high, dwarfing the visitors standing next to it. 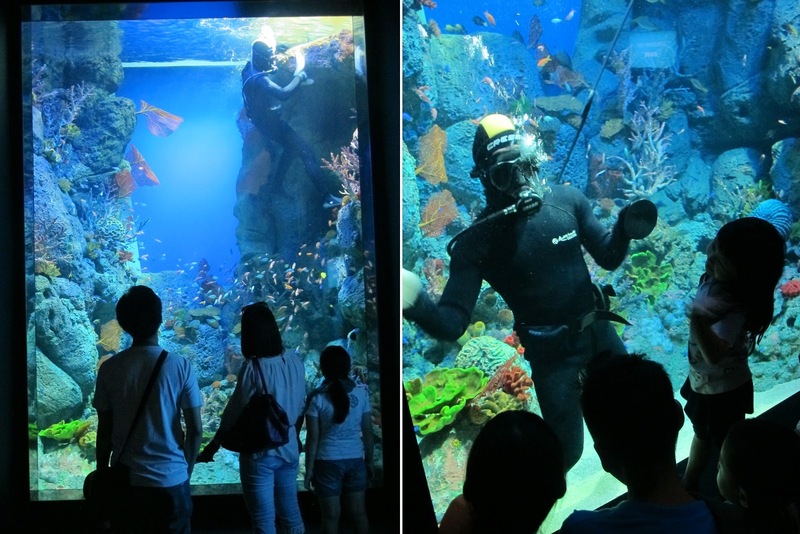 Interactive digital panels allows you to swipe between fish photographs to find the one 'you just saw' and determine its identity and other information. Here we observed schools of colourful smaller fish swimming in and out of the 'coral' structures. There was a feeding going on and bits of food were raining down on us, sending the fish into a feeding frenzy and turning the tank into a swirling rainbow pillar. The adults took the opportunity to sit down on a bench while the kids entertained themselves swiping the interactive displays. There was a staircase to a raised terrace for visitors who wanted view the exhibit from it. ... and typical mangrove critters such as tree climbing crabs, mud crabs, and brackish water fishes such as the Archer fish. An odd looking creature found up to 700 m below the ocean's surface is the Nautilus. This animal belongs to the Phylum Mollusca along with other animals such as snails, slugs, squids, and octopuses. 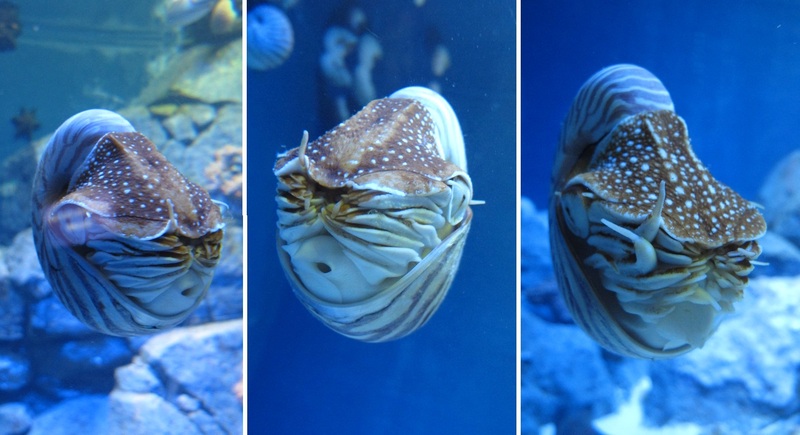 The spiral shell of the Nautilis resembles that of a snail, but the tentacles and large eyes seem to correlate better with an octopus or cuttlefish. These are often scavengers that feed on carrion and other dead animals that fall to the ocean's floor as they decompose. 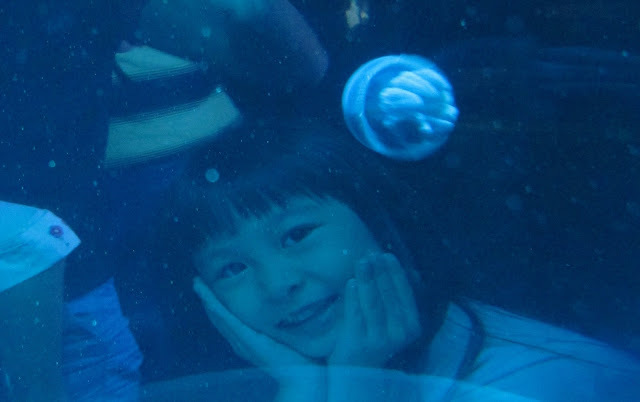 At the jellyfish section (ahem... they are not fish), smaller tanks allowed us to observe smaller ones up close. One has to wonder how these primitive creatures survive without a brain or central nervous system! In other tanks, the jellies got rather large. Just looking at them makes the little hairs on your arms stand. 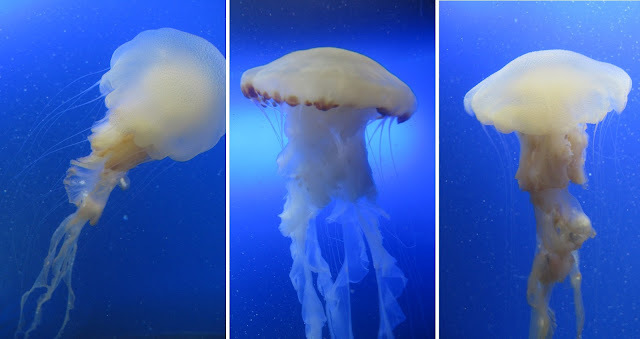 We spent quite a bit of time getting good pictures of these creatures, pulsating regularly like a beating heart as they gracefully glide around the tank. 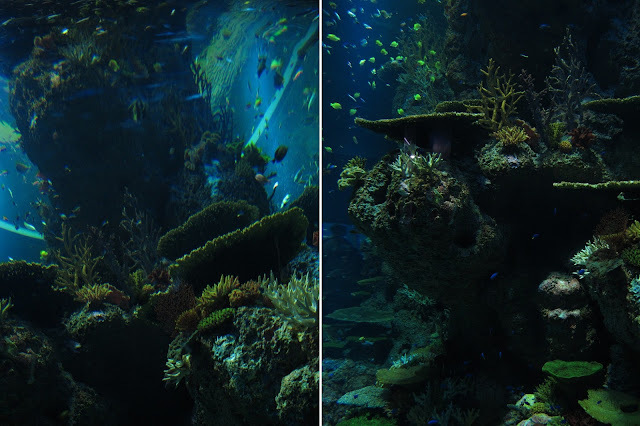 But just as the walking was about to make our legs weary, we stumble upon the centre-piece of the park, none other than the world's largest reef tank! Borrowing a term from my brother-in-law, I'd like to refer to it as the 'Underwater Omnimax Theatre'. At top-centre of the photograph you see a majestic Manta Ray. The giant is dwarfed by the size of the viewing gallery. Three tiers of viewing platforms were crowded with people standing around, sitting around, lying around, even on picnic mats and bean bags (provided) snacking on tidbits. Snacks can be bought at the nearby snack shops, but many people seemed to whip out their own home-prepared snacks and drinks. And what kinds of marine life plough the giant screen? We saw large nurse sharks, rays of all kinds, pelagic and schooling fish, large Shovel-Nosed Rays at the reef floor, Napoleon Wrasse, sea turtles... if you've ever watched the National Geographic Channel, you can imagine. If you walk to the right of the lowest platform you enter what I'd refer to as the 'Oval Office', an all round viewing gallery with viewing panels even on top of you. We finally decided to leave our comfy little corner(s) and head for the exit. We were hungry for some food (fish maybe?) as it was lunch time. Along the way out were even more exhibits, but what were these compared to what we just saw? Still, we gave some attention to the touch pool. Unlike that at UWS, this one had no volunteers to assist and explain (except during the stipulated 'touch' time), and to ensure clean hands before touching to prevent disease and infection, and many of the kids were not even aware that they were allowed to put their hands in. Still, it was an opportunity for more close up encounters. Another honarable mention was a tank crowded with mean looking Moray Eels. Here, the kids (and those of you who are kid-sized) get to enter a small entrance which led into a room sized viewing gallery to see the enclosure from below. At the exit there's a booth to have photos taken which you can buy, and a small conservation corner with informative posters and some activity tables for kids. However, at this point, we were to tired and hungry and breezed out. Every aquarium needs to have a souvenir shop at the end and this was no exception. The world's biggest fish tank had a shop that matched its size resulting in much browsing, but we did not manage to find something unique to add to our fridge magnet collection here. We found that while there were many dining options, many were pricey restaurants, and during the school holidays, the place was so packed many of these restaurants were fully booked. We settled for local fare at Toast Box and guess what we ordered? Perhaps MLP inspired... FISHballs swimming in noodle soup! 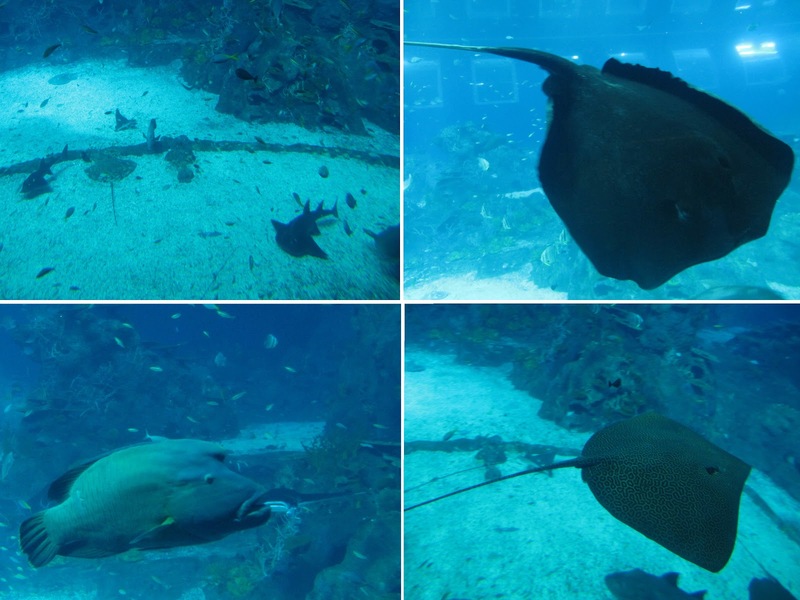 Even though there are currently no shows like those featuring dolphins and seals at UWS, and the touch pool at RWS has much smaller rays as compared to the ones at UWS...and not forgetting the shark feeding that the kids were so crazy about in UWS. Entry fees at both are comparable, so if choosing which one to visit is too hard for you, why not do both?